The new emperor of Jurai, he poses as the rightful hire to the throne, Yosho. Grandfather, being the real Yosho, knows that something is very wrong. 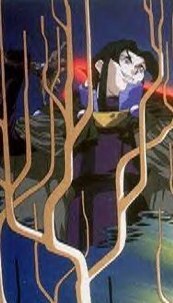 When Ayeka and Sasami are accused of treason to Jurai, and find that Jurai has a new emperor by the name of Yosho, Ayeka with the help and support of grandfather, Tenchi and others, begin their journey to Jurai as outlaws to straighten things out. Although the family does not yet know grandfather's secret identity from the get-go, they soon suspect something when grandfather navigates them to Jurai's sacred place for temporary safety. He finally reveals that the foony emporer is actually Kagato, an old friend of Yosho before he turned evil, obsessed with the power of Jurai. Many years ago, Yosho defeated Kagato in a legendary battle and then disappeared. Now Kagato is back as the most powerful known being in the universe, with his powers unbelievable and keeping him forever young, which explains the physical age difference between Yosho and Kagato. But, Tenchi finds that he has a power greater than his grandfather. Its now up to him to save Ayeka and to end evil's rein.